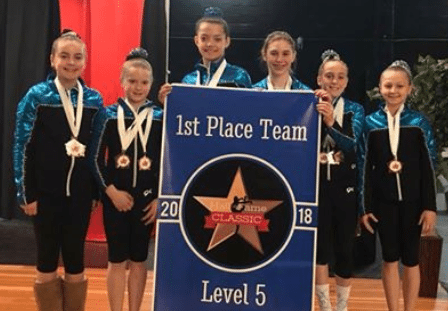 New England Gymnastics Training Center of Hudson captured first place in the Levels 3, 4 and 5 competitions in the 2018 Hall of Fame Classic held in North Andover, Mass. Nashua’s Allie Marone led the way, earning first place in the Level 3 Senior division All-Around. Nashua’s Hailey McMahon’s second place All Around, and first place finishes on the uneven bars and floor led the way for the Level 5 girls. For the Level 4 girls, Ayla Pullen earned second place in the Senior division, including a first place on the floor and a pair of second place finishes on the vault and balance beam. Ashlynn Hall added first place finishes on the vault and uneven bars in the Child division. Nashua’s Sophia Witkowski placed first on the uneven bars for the Level 3 team. While Allie Marone added first place finishes on the vault and beam, in addition to her All Around title. Jayla Gathright won the vault and Gabriella Alvarado finished second on the balance beam for the XCEL Bronze team. Abbey Herbert tied for first place on the vault for the XCEL Silver team. Sophia Witkowski, Nashua, placed fifth All-Around with a score of 35.450. She received a 8.750 on Vault (fifth place), 9.350 on Bars (first place), 8.450 on Beam (seventh place), and 8.900 on Floor (fourth, tie). Allie Marone, Nashua, placed first All-Around with a score of 37.250. She received a 9.250 on vault (first), 9.200 on bars (fourth), 9.600 on beam (first), and 9.200 on Floor (second place). Ashlynn Hall, Nashua, placed fifth All-Around with a score of 36.350. She received a 9.250 on vault (first), 9.500 on bars (first), 8.775 on beam (fifth), and 8.825 on floor (eighth. Ayla Pullen, Nashua, placed second All-Around with a score of 36.600. She received a 9.100 on vault (second), 9.175 on bars (third), 9.100 on beam (second) , and 9.225 on floor (first). Hailey McMahon, Nashua, placed second (tie) All-Around with a score of 35.700. She received a 9.200 on vault (second), 8.875 on bars (third, tie), 8.950 on beam (seventh), and 8.675 on floor (fourth place). Jayla Gathright, Nashua, placed fourth All-Around with a score of 36.100. She received a 9.200 on vault (first), 9.000 on bars (fifth), 8.650 on beam (10th place), and 9.250 on floor (fourth). Gabriella Alvarado, Nashua, finished fifth All-Around with a score of 35.850. She received an 8.900 on Vault (eighth, tie), 8.900 on bars (seventh, tie), 9.300 on beam (second), and 8.750 on floor (12th). Abbey Herbert, Nashua, placed eighth All-Around with a score of 35.000. She received a 9.000 on Vault (tied for first), 8.700 on bars (tied for 11th,), 8.500 on beam (10th), and 8.800 on floor (eighth, tie). Three Merrimack Youth Wrestling Program competitors took titles in the Annual Schweitzer Memorial K-8 Wrestling Tournament held at Riverside Middle School in Springfield, Vt. The tournament was four-six man round robin brackets. Merrimack brought fifteen wrestlers to compete. 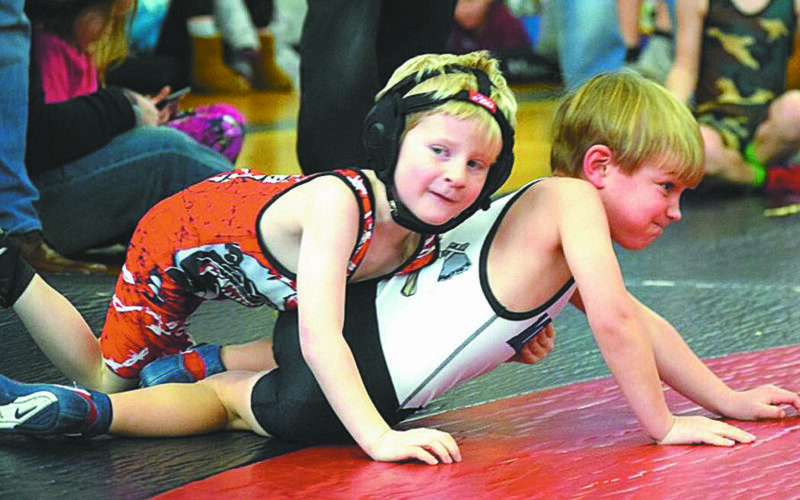 Fourth graders Cayden Dine and Jackson Meehan were two of the Merrimack wrestlers who grabbed champ titles in the third/fourth grade brackets. Dine had four wins on the day completing his first two by pin. Meehan had five wins in the six-man bracket with four of them by pin. Meehan also competed up in the fifth/sixth grade bracket grabbing second place medal and two wins by pin. Meanwhile, Brendan Curley, grade 6, was the final MYA wrestler to take a first place medal with two wins by points on the day. 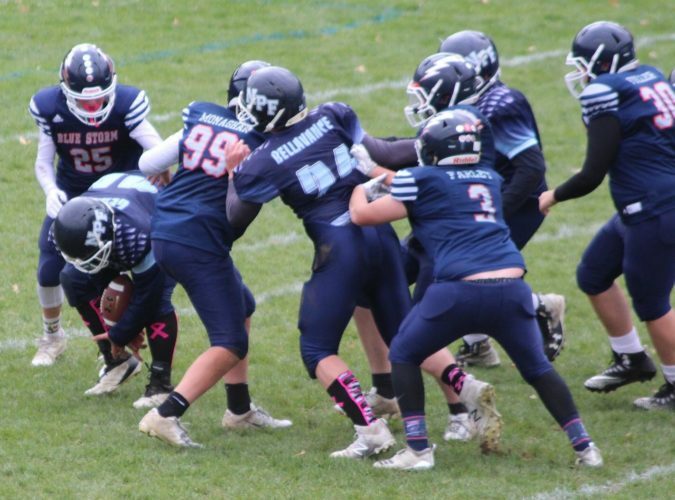 His first was a commanding win and his final match was a nail-biter win by two points in overtime. Kindergartner Kameron Lewis completed two wins by pin on the day and getting a third place medal. Bennett Meehan, K, also fought hard in his respective bracket taking fourth place on the podium. Ryan Marone, grade 2, had one win by points and one very narrow loss by a mere two points grabbing third place on the day. 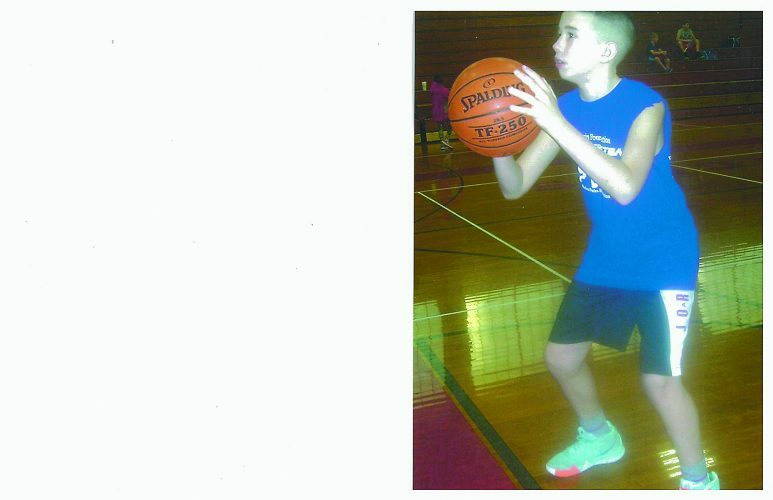 Merrimack’s third grade representation consisted of Kael McAloon, Micah Dodds, Aiden Kennedy and Luke Emond. McAloon had one very narrow loss in his final match that he was leading. He fell in the final seconds when his opponent made a reversal outscoring Kael in the final seconds putting him in fourth place. Emond pinned his fourth opponent in his final match taking home fourth place medal in the five-man bracket. Dodds and Kennedy wrestled tough in their respective brackets taking fifth and fourth place, respectively. Gryffen Gelinas and John Regal, grade 4, took home second and third place medals respectively. Gelinas won his first match by a commanding margin in points and by pin in the final round. Regal snagged one win by points on the day. Mitchell Krupp and Owen Forrest, grade 6 each grabbed third place medals. Krupp’s win on the day was by points and Forrest’s was by pin. Forrest’s second match was a back and forth battle where he lost by a mere point in the final seconds. Eighth grader Hunter Adams fought hard in a very tough bracket bringing home fifth place medal on the day. Tryouts for the Southern NH Cavaliers 2018 – 2019 Midgets team will be on Sunday, March 18 at Skate 3 in Tyngsborough, Mass. Skills will be at 9:40 a.m. with a scrimmage at 10:50 a.m. The Nashua Baseball Umpires Academy annual Umpire Academy continues through the end of March. This training is for new or returning umpires interested in umpiring at the Cal Ripken or Babe Ruth levels. Sunday March 11 is the last day to register for the spring session. For additional information, go to nashuaumpires.org and follow the Umpire Training link, email nashuaumps@gmail.com, or call 203-8569. Nashua Cal Ripken Spring 2018 Registration is now open. Cost of registration for T-Ball, Rookies, and Minor levels is $40, while AAA and Majors levels are $50. Family Registration Cap is $75. Interested players may register at nashuacalripken.orgor contact info@nashuacalripken.orgfor more information. The division of Babe Ruth baseball is beginning its 36th year. 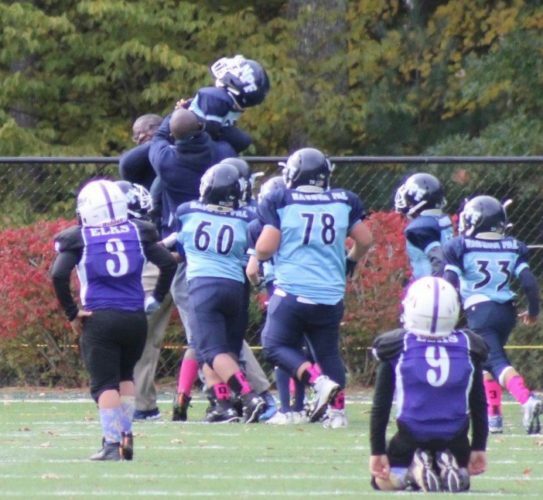 In All-Star competition, Nashua was the 2017 12U state champions and the 2017 11U state Champions.